Home > Distros > Debian VS Ubuntu – Which One Should You Pick? It will take a while to name all the available Linux distros out there. However, if we only stick to the most popular options with stable community support, we can narrow the choice to several operating systems. If you have never used a Linux-based system before, you may have a dilemma. For example, you may be wondering who would win in the Debian VS Ubuntu duel because you would like to give a chance to the winner. Our comparison article might help you with that. 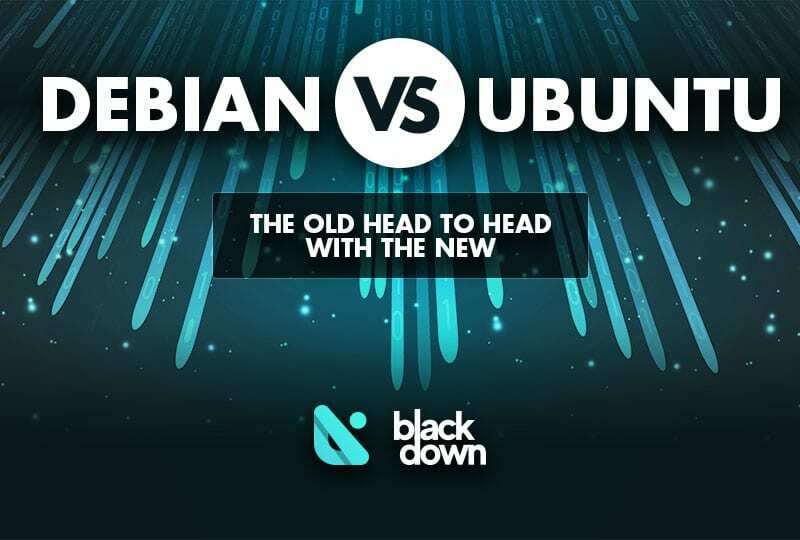 Since Ubuntu and Debian are among the most popular Linux-based operating systems out there, it was only logical to see how they perform in comparison. As you will notice, we compared various areas that may be relevant to both beginner and experienced users. The goal was to make an all-around article that will show you why you should pick one or the other. Debian has been around for more than 25 years considering that it was first developed in 1993. It is one of the oldest Linux-based operating systems still available. Ubuntu was based on Debian, but it first appeared more than a decade later – in 2004. When it comes to releasing cycles, Debian’s schedule is far more complicated. You can always find three different releases of this OS – unstable, testing, and stable. As you might suggest, the stable version is truly solid, but its packages might be a bit outdated. That is the primary reason why it is primarily used on servers. If you are looking for fluidity, feel free to choose the testing version of Debian. Do not think for a second that there is a reason to doubt its stability. Instead, think of it as the best option for individual and home machines. If you insist on using the latest packages, you may try the unstable version, but the developers often iron things out and make adjustments, which is why it may not be reliable as an everyday option. Things are far simpler with Ubuntu. The developers make sure to release the LTS version every two years. LTS stands for long-term support, and each of these releases ensures you will get support for the next five years. Apart from that, an updated version of Ubuntu hits the digital shelves every six months. If popularity matters to you, the official statistics emphasize that Ubuntu is the more popular Linux distro. From all the machines that use Linux, Ubuntu runs 23% of them while Debian has a 16% market share. How Easy Is It to Set Up Debian and Ubuntu? You shouldn’t have any problem with installing either of the operating systems. They both support various architectures, including ppc64, arm, and amd64. Debian includes support for some other architectures, too, such as mipsel, ia64, and i386. The developers are aware that they need to make Linux more friendly to the regular users, which is why both Ubuntu and Debian offer a graphical user interface for the setup process, as well as for using the systems later. You could say that it may take a bit more time and effort to install Debian. If you prefer having extra options for customization, you will love that. On the other hand, if you are looking for a simple installation process that doesn’t take more than several steps, Ubuntu is the right choice. What Software Do You get When You Install Debian and Ubuntu? That is a great question! First of all, both of the systems come with a set of pre-installed apps to get you started. You will find the usual software choices, such as an office suite, internet browser, and file manager. Debian and Ubuntu both come with a software manager. They are graphical, and you should have any problem finding your way around them. However, there is one crucial difference. By default, Debian only focuses on software that is available for free. The developers are seriously dedicated about keeping everything related to the OS accessible to everyone, and that is why they made that decision. That doesn’t mean you cannot install paid apps on Debian, but it will require a bit of effort, especially if you are a newbie. On the other hand, Ubuntu developers keep an open mind when it comes to premium apps. You can easily install software that is open-source and free, but also the apps that you need to pay to use. It shouldn’t be a problem to use the search box or navigate through the categories until you find the desired app. How Easy Is It to Use Debian and Ubuntu? We want to pinpoint that both Debian and Ubuntu allow you to choose between several desktop environments. Ubuntu does have an advantage here as it is more user-friendly than Debian. The reason is that multiple environments are already pre-packed, including Gnome, Xfce, and KDE. The only thing you need to do is to select your favorite, which works like a charm if you are a beginner. Debian users might need to put in a bit more effort, but they can choose between more desktop environments than those using Ubuntu. As a result, we can conclude that Debian is the operating system tailored to advanced users who have a certain level of tech knowledge. It is a simple question, but we do not have a simple answer for you. Linux-based systems are generally a much better option in terms of performance than MacOS, and especially Windows. They are less demanding in terms of hardware, which means you can run Linux on old machines, too. If you compare Debian and Ubuntu specifically, Debian might be somewhat faster. The reason is that it is as lightweight as an operating system could be. It doesn’t come with any extra features or software, but you can configure everything to your preference. Ultimately, if you have ancient hardware that you want to keep using, Debian is probably a better option. Alternatively, if you have a fairly strong machine and you prefer a modern-looking and visually pleasing operating system, go with Ubuntu. When it comes to open source software, community support may decide whether the project will be successful. Debian and Ubuntu are standing well with the community, and they have a reputation of popular operating systems. Canonical is a company that stands behind Ubuntu and offers support for this OS. Apart from that, thousands of volunteers and enthusiasts also work on improving this operating system. Debian completely relies on the community and those willing to help, but that also works great. Can I Use Them in Some Other Purposes? We focused on analyzing Debian and Ubuntu as home operating systems, but what about their other uses? For example, you may be looking for a Linux-based system to use on your server. It is here where the security should be your top priority. Ubuntu might be a suitable option for home use, but Debian is more secure if you compare the two. Additionally, Debian seems more stable, which is another reason why many prefer using it on corporate servers. It is, however, interesting to note that Ubuntu is the more popular choice on public servers. Although the market share numbers are close (37% VS 31.4%), Ubuntu still is the favorite. Perhaps the fact that it is easier to use is the reason behind that. Ubuntu offers a firewall and AppArmor with the installation, and there is not much customizing to do by the users. What Do You Need from an Operating System? The final and the most important factor to take into consideration is what you expect from a Linux-based operating system. Do you need it to be extra fast so that you can use it effortlessly on your old hardware? Are you looking for a visually pleasing OS that will make the transition from Windows and MacOS seamless? What about the available apps – are you ready to pay to use software or free apps are enough for you? Do you consider yourself a tech dummy (no offense) or you have at least an average-user knowledge? It is not about choosing the right or wrong operating system because both Debian and Ubuntu are extremely popular and thousands love them. It is about picking the OS that will meet and exceed your expectations, and that should be your goal. Both Debian and Ubuntu have some clear advantages in the direct comparison. Debian has an installation process that is a bit trickier, and you may need to put in some effort to install all the software you need. However, it is incredibly fast and super-safe, which makes it suitable for servers and old hardware. Debian may be more focused on users that have some tech knowledge and like an operating system that they can completely customize to suit their preference. Ubuntu is more user-friendly than Debian, and that becomes obvious from the installation process. It is a bit more demanding in terms of system requirements, but it will allow you to pick both free and paid apps and install them effortlessly. The good news is that both operating systems have excellent community support, which is the real proof of their quality and popularity. When it comes to the winner of the Debian VS Ubuntu battle, only you can decide it. There is no one size fits all here, and you will have to consider your expectations to see which of the two is a better fit.